You will leave the port aboard a coach for an hour and a half drive along Provincial Route 603 to Marble Mountain where you can have a chance of overview Da Nang city from the top of mountain. Here, Non Nuoc Stone-Carving Village at the foot of the Marble Mountain, where you can find firsthand skilled carvers chisel out a great variety of fine marble products of all sizes and designs. Next will be the exploration of Hoi An , an ancient town of Quang Nam Province, is located on the banks of Thu Bon river. Strolling around the town through its narrow streets, you will find a fascinating blend of European, Chinese, Vietnamese and Japanese temples, community houses, shrines, clan houses, shop houses and homes. 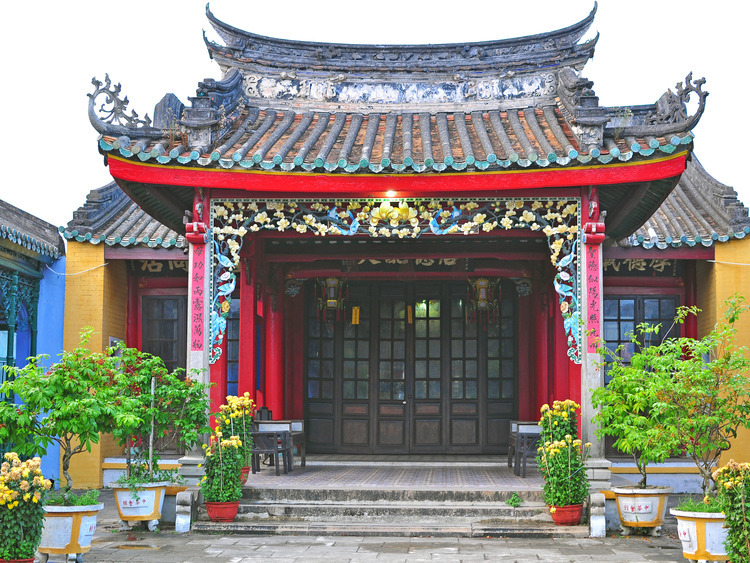 Upon arrival in Hoi An, you will visit the Hoi An Museum of History and Culture. The museum was constructed at a place where once was a temple of "Quan Cong". In here, you will see many exhibits on the foundation, development and depression of Hoi An Ancient Town. Your next stop is the Assembly Hall of the Fujian Chinese Congregation. The assembly was founded in 1697 by Fujian Chinese merchants of Hoi An as a place to hold community meetings. Later on, it was transformed into a temple for the worship of Thien Hau, the Goddess of the sea and Protector of Fishermen and Sailors. This temple is architecturally unique with its artistic ornament and beautiful statues. Now you are heading to a workshop. In here, you will explorer different traditional handicrafts such as wood sculture, mat weaving, embroidery, silkworm breeding, silkworm unravelling etc...Your tour program will continue with a visit of the Japanese Covered Bridge Pagoda. The pagoda was built in 1593 by the Japanese Community of Hoi An to link their neighbourhood with the Chinese Quarters. The bridge was provided with the roof so it could be used as a shelter from both the rain and the sun. On the Northern side of the bridge is a Japanese Pagoda to protect sailors.. Leaving the bridge pagoda, you are now proceeding to one of the old houses in Hoi An town. The old house was constructed almost two centuries ago as the house of a Vietnamese merchant. The design of the house shows how local architecture followed Japanese and Chinese influences. Your last stop is in Hoi An market. Located on Thu Bon river's bank, the market is considered one of the most convoluted sites of Hoi An Ancient Town. Unlike any market places in the world, Hoi An Market includes different types of commodity such as fish, vegetables, meat, fruits, handicrafts, cloths, jewelry etc... Last before returning the ship, you will have lunch in a typical Vietnamese restaurant. Finally, your coach will follow the same route back to Da Nang City, where you will enjoy a 30-minute sightseeing tour. Da Nang is located on the west bank of Han river. Formerly known as Tourane under French rule, it had grown from a small fishing village into an important port in central Vietnam. It was also the landing point of the Americans during the Vietnam Wars. Today, Da Nang is the fourth largest city in Vietnam offering many fascinating cultural and historical places of interest. Reboard your coach, you will return the port for re-embarkation. Please wear comfortable walking shoes and casual clothing. To reach the top of Marble Mountain you will climb about 150 steps. This is a walking tour, not recommended for people with mobility problems. Don't forget to bring mosquitoes repellent.